The heavy-lift Ariane 5 ECA for Arianespace's next dual-payload mission has completed the initial build-up with the integration of its vehicle equipment bay - also known as the launcher's "brains." 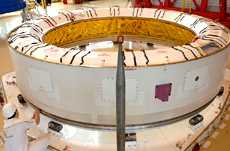 Supplied by EADS Astrium, this large ring-shaped component is equipped with the power distribution system, flight control unit, telemetry system and other elements that provide flight guidance, orientation and sequencing during the Ariane 5’s mission. The vehicle equipment bay is readied for integration on the Ariane 5 ECA. The vehicle equipment bay’s advanced systems include highly precise laser gyros – which help give Ariane 5 the most accurate orbital injection of any commercial launch system. This ensures spacecraft payloads are placed in the right orbit, every time, thereby maximizing the satellites’ revenue-producing operations during their operational lifetime. With the vehicle equipment bay now installed, preparations are continuing with the Ariane 5 ECA inside the Spaceport’s launcher integration building at French Guiana. The vehicle subsequently will be transferred to the final assembly building, where the mission’s two payloads will be integrated. Passengers for the upcoming flight, scheduled for May, are Satmex 6 and Thaicom 5. Satmex 6 will be operated by Satelites Mexicanos, S.A. de C.V., a leading satellite services provider in Latin America; while Thailand’s Thaicom 5 spacecraft will join the satellite fleet operated by Shin Satellite Public Company Limited.